The Halloweensie Contest Finalists – Vote For Your Favorite!!! The time has come, the walrus said, for the Halloweensie Contest Finalists to be revealed!!! I can just feel the very air quivering with excitement!!! Let me just say that I was bowled over – by both the number and the quality of the entries!!! I NEVER expected a turnout like this! I was so happy at the response and enthusiasm – really it was just wonderful! I had SO much fun going around to read each new entry as it was added to the list – each better than the last. I hope you all had as much fun with it as I did. Now, I realize I said I’d try to narrow the field down to 3 finalists, but you all know I can pretty much never do that anyway 🙂 and that was before I knew there were 38 entries! And in this case there were so many great entries that cutting any of them was brutal! So after much hemming and hawing and gnashing of teeth and consulting with my lovely assistant, I have ruthlessly done away with more than 75% of the competition – much as it pained me! – and have left you less than a quarter to choose from (and that’s just as close as we’re going to get to correct percentages because math is not my thing!) And I’d like to say right up front that many of the entries that were cut I was EXTREMELY nitpicky about because I had to cut something! They were all excellent! I would also like to add that, for spookiness/creepiness, Renee (’round the moonlit town) and Sidney (The Last House) should receive honorable mention. And for the other 2 stories that I finally cut because I decided 10 finalists was just too many and these were a little more like character sketches than stories but still really, really good, honorable mention to Cathy (The Halloween Queen) and Lauri (No Trick-orTreating For Jack). But really – excellent job EVERYONE, and thank you all for providing us with such fantastic Halloween entertainment! of her little pointy hat. and grab an extra sweet. you MUST tend her sweet tooth! The sky quickly filled with a hover of trout. “Kibosh! and Pish-posh!” Tamsin yelled with finesse. A chorus of frogs joined the fish-slippy mess. The trio went guising, Pam, Tamsin and Lil. her pointed toes quiver with glee. all the ghouls come to play. This night will be super spooky. carved pumpkins do flicker and scowl. cold wind swoops around with a howl. the wild creatures party all night. dares to come trick or treat. They’re all in a shivering fright. Ghost heard an eerie sound. He trembled beneath his sheets. Ghost froze. “It’s probably just a bat,” he said. He hid behind the curtain and peeked out his window. “How could I forget?” said Ghost. He called Mummy, Skeleton, and Witch. They dashed out of their house. They scurried to the streets, running amuck until they reached their hiding place. A banana whizzed by them. “This is the scariest Halloween ever!” said Ghost. 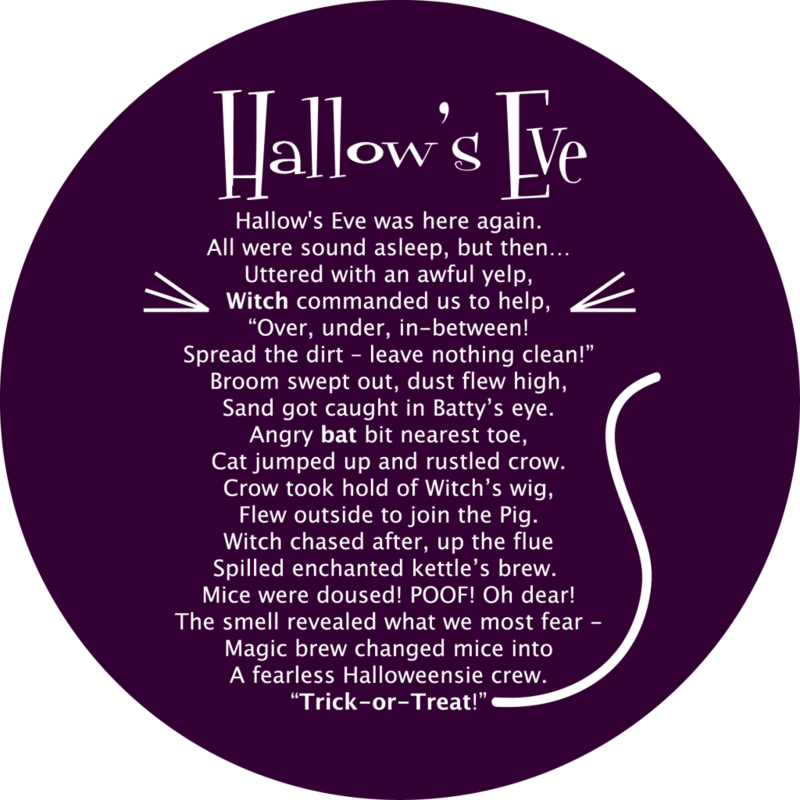 Winifred stared at the calendar, “It’s Halloween! Unimpressed, her black cat, Ebony, turned away and returned to slumber. Just for today . . . turn me into a Cat! With a very round face, a stem on his lid. On Halloween night, Jack met an old witch. He begged for a spell and presented his pitch. And all sorts of other odd, horrible things. “My pumpkin head’s gone! I feel….BOO!” Jack haunted. I know! Tough choice, right? We need all the votes we can get! Ready, go! I'm excited to find out who the winner will be! This is so much fun! I voted yesterday, but wanted to come back and leave a comment. Thanks for adding a huge dose of fun to writing, Susanna. I am so thrilled with the number of entries you got! So many to choose from. I wasn't able to cast my vote on election day afterall – traveling with a toddler kept me busy. It really was an exceptional field of entries, and I was very sorry to relegate yours to HM – I really liked it! I too was really impressed by how well everyone did with such tough parameters! I voted and I wish everyone the best of luck!!!!!!!!!! So many talented writers. Yahooiieeee!!!!!!!!!!!!!!! Susannah ~ Thanks for including all 8 posts in ONE place so we can contrast and compare and vote for our favorite with “one stop shopping.” And thanks for tossing extra TREATS into the prize bin. You rock. I know! Really hard, wasn't it? Everyone is so talented! Thanks for voting!!! Congratulations and good luck to the finalists. If you have a chance I'm running a Christmas Give-A-Way on thefeatherednest. Thanks Susanna, for the opportunity to partiipate in your contest.